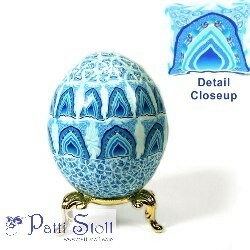 The design on this egg was inspired by the Taj Mahal. I have this and two other similar art eggs, available. The Taj Mahal contains superb examples of ancient Islamic or Arabic art. Ancient Islamic art is found in Russia, India, all the Middle Eastern countries, and in many other countries of the region, all the way to Spain and Morocco. Intricacy of design was (and still is) the single most important aspect of this style of art and it was fused into the very architecture of the ancient buildings. 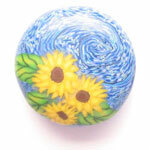 This lovely, collectible egg is made from a real egg, covered in artist's quality polymer clay. 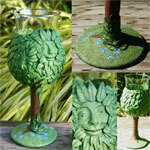 The design is achieved by creating patterns with the clay. No painting is involved. Because it is not painted, it will never fade or peel. Each egg has at least two layers of clay, to ensure strength and durability. It is polished to a high glass-like shine. This art egg is about size 7 3/4", measured around on the long circumference. Each egg is a one-of-a kind original work of art and no two are identical, because they are not mass-produced. My collectible art eggs are a perfect gift for egg collectors. It comes with a simple brass stand and a gift box, with a Certificate of Authenticity, signed by the artist.